I’m excited to announce that on Thursday, December 8 at 7:30pm Pacific we will have a special edition of Virtually Connecting ePatients hosted by Rebecca Hogue (@rjhogue). 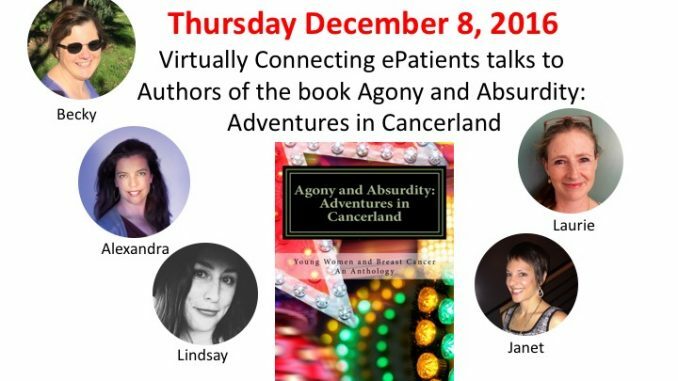 In the session, a few of the authors (Rebecca Hogue (@rjhogue), Janet Sollod (@interplanetj), Lindsay Jean Thomson (@lindsayjeanthom), Laurie Pomeranz, Kristen Zeiter, and Alexandra Fraser) from the book: Agony and Absurdity: Adventures in Cancerland: An Anthology will be on Virtually Connecting ePatients to read and discuss why they chose to include their stories in the anthology. We have room for a few people, if you’d like to join the conversation – please leave a comment or email info@virtuallyconnecting.org. You can also watch the conversion using the YouTube link below.